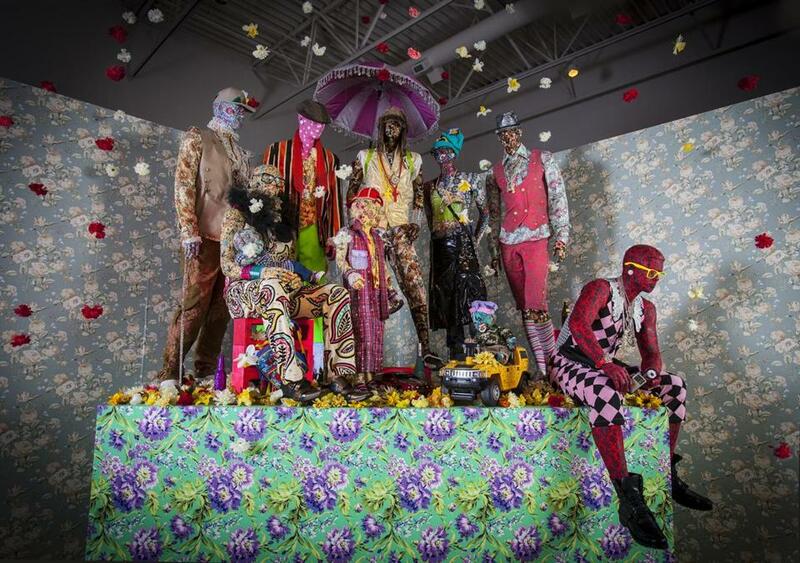 Ebony G. Patterson’s “Swag Swag Krew,” at Boston University’s 808 Gallery. Jamaican dancehall music, since evolving from reggae in the 1970s, has percolated with contradictions. It rejects the mellow spirituality of reggae and reflects street culture. Critics have decried its sometimes violent and homophobic lyrics. In recent years, a new aesthetic has snuck in, one that plays off dancehall’s celebration of fashion, bling, and looks. Dancehall’s men now dress in gaudy, tight-fitting outfits; they color their hair; they bleach their skin. The style embraces femme, even if the lyrics don’t. Jamaican artist Ebony G. Patterson plunges into the mixed messages of dancehall culture in dense, sparkling tapestries and an installation at Boston University’s 808 Gallery. The latter, “Swag Swag Krew,” transforms several male mannequins from Ken-doll bland to a visual riot: The wild patterns and neon tones of their clothes clash and compete; their faces swim with floral patterns, and they perch on a garishly wallpapered pedestal. It amounts to cocky camouflage, commanding the eye but averting personal connection in favor of performance. Beneath all that swag, there’s a hollowness. Patterson embellishes her captivating jacquard-woven photo tapestries with glitter, lace, crocheted flowers, and more. They lie flat, near the floor. For all their dazzle, these are elegiac works, marking murders and lamenting the disposability of life in lower-class Kingston. It takes a moment to find the figures in “Where We Found Them” amid a bed of crocheted pink carnations, printed flowers, and twinkling glitter. Two sets of shoes sit on the carnations. They point the way to images of a man and a woman in sharp, eye-catching garb. They might be dancing; on the other hand, their splayed limbs recall the chalk outlines at crime scenes. They have no heads, which makes them just two more nameless victims. Patterson entrances with her luster. She pulls viewers in as if they were Hansel and Gretel expecting sweets, only to find pain and grief inside. Cate McQuaid can be reached at cmcq@gmail.com. Follow her on Twitter @cmcq.